Several postsynaptic proteins are present in large copy numbers within the PSD, including members of the PSD-95, GKAP/SAPAP, shank and homer families, which have been estimated to contribute several 100 molecules each1,2. Given the propensity of these proteins to engage in multiple intermolecular contacts, and to form large clusters when co-expressed together in heterologous systems5, one may ask why PSD proteins do not aggregate at any random place within the dendrite. In fact, shankl multimerizes in heterologous cells in a filamentous form associated with keratin filaments, due to an interaction between the ankyrin and SH3 domains of shankl. Presence of the interaction partner GKAP/SAPAP leads to an aggregation of both proteins in aggresomes. Only when a third protein of the complex, PSD-95 is present, regular clusters of all three proteins are observed in overexpressing cells as well as in neurons. This indicates that PSD proteins influence each other during complex formation, and precise control of intermolecular interaction is required to avoid unproductive aggregation of these proteins as observed in heterologous systems5. So, where does assembly take place? 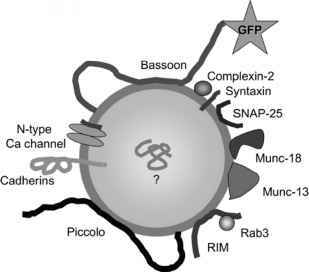 A transport package model, where postsynaptic complexes might be assembled within the cell body and then be transported in a vesicular form to axo-dendritic contact sites, would be analogous to the situation at the presynapse, where Shapira and co-workers6 have identified a population of transport vesicles containing multiple critical elements of the cytomatrix of the active zone. Within dendrites, membrane proteins obviously need assistance in terms of motor-protein dependent vesicular transport. This was reported, e.g., by Washbourne and colleagues7 who observed large fluorescent NMDA-receptor particles to be transported to the postsynaptic site (see also Chapters 6 and 13). The role of postsynaptic scaffold molecules, such as PSD-95 or GRIP in linking postsynaptic cargoes to their respective motor proteins, is reviewed in Chapter 12. Despite these and some other studies demonstrating existence of large postsynaptic transporting complexes, the dominant view is that components of the PSD are largely assembled locally in dendrites. Evidence for local assembly comes from the observation that postsynaptic clusters of GFP-labeled PSD-95 accumulate in dendrites, apparently from diffuse cytoplasmic stores of the molecule which are present locally8. Extending this approach to other postsynaptic components, Bresler and co-workers recently demonstrated that several postsynaptic proteins exhibit similar kinetics in cluster formation, i.e., single exponentials with rate constants in the range of 12-14 min9. This is consistent with a mechanism of co-clustering of these molecules, whereby addition of one postsynaptic protein to the complex requires the previous addition of another one, and so on. Thus PSD-95, shank proteins, and the NMDA-receptor subunits analyzed in this study do not form clusters by themselves but require certain signals such as the previous association with other postsynaptic proteins in order to form clusters. As all these proteins are apparently also present within dendrites in a nonclustered form, this implies that individual PSD proteins are somehow prevented from association with each other; one possibility would be that molecules such as PSD-95 or shank are in a "closed" conformation, in which individual domains are not accessible for binding to their respective ligands. An important question would then be which signals would lead to a conformational change, allowing binding of protein ligands and triggering complex assembly. Several molecular mechanisms have been discovered recently which converge on the PSD-95 family of proteins. PSD-95 (and other MAGuK family members) exhibit an intramolecular interaction in their C-terminal region, which involves the SH3 und GK domains10,11. Analysis of the 3-dimensional structure of this part of the molecule has revealed that the GK domain is actually inserted into a noncontiguous SH3 domain, in a way that sequences N- and C-terminal to the GK domain link up to form a P-sheet that is part of the SH3 fold12,13. This interaction may occur in an intramolecular or intermolecular fashion10, potentially allowing for the regulated assembly of a multimeric array of PSD-95 molecules14. The importance of this arraying capacity is demonstrated by mutations which interfere with the SH3/GK interaction and which disrupt channel clustering by MAGuK proteins. In Drosophila similar mutations lead to a loss of MAGuK function, suggesting that the ability of the PSD-95 homolog discs large to form membrane associated complexes critically depends on the ability of the SH3/GK domain to multimerize. Further evidence for intramolecular interactions in the related SAP97 protein was presented by Wu et al.15, who identified a regulatory effect of the N-terminus of this protein on the ability of the C-terminal GK domain to bind GKAP. Regulation of PSD-95 appears to occur also at the N-terminal end of the protein via different mechanisms. El-Husseini et al.16,17 demonstrated in an extensive series of experiments that reversible palmitoylation events lead to modification of two Cys residues in the N-terminus; palmitoylation is necessary for the synaptic targeting of PSD-95. The N-terminal 64 residues of PSD-95 are also required for multimerization18. This multimerization can be prevented through phosphorylation of this region by cdk5, leading to a reduced size of clusters in recombinant systems as well as in vivo in a mouse carrying a deletion in the cdk5 gene19. Taken together, these findings show that the ability of PSD-95 and related proteins to multimerize and cluster their binding partners is tightly controlled by intramolecular interactions and various post-translational modifications. 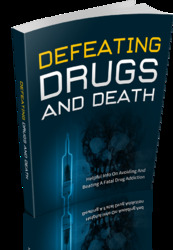 This Book Is One Of The Most Valuable Resources In The World When It Comes To Helpful Info On Avoiding And Beating A Fatal Drug Addiction!